Kenton Klassen and John Voth as brothers Valene and Coleman in the Cave Canem Production of The Lonesome West. Photo by Matt Reznek. Good thing there isn’t a drinking game attached to The Lonesome West. We’d be in real trouble if we had to take a shot each time someone uttered the word “feck”. It would probably land us in as much trouble as brothers Coleman and Valene in Martin McDonagh’s pitch black comedy. Minus the murder, of course. The finale in McDonagh’s Leenane trilogy, which also includes The Beauty Queen of Leenane and A Skull in Connemara, the three plays take their collective name from a tiny village in County Galway, on the west coast of Ireland. Born to an Irish father, this was McDonagh’s summer stomping grounds as a youth. And yes, he has a brother, of which he described his relationship in The New Yorker back in 2006 as “love, love, love, and a tiny spark of hate”. It is perhaps easy to see then where he might have gotten at least some of his inspiration for The Lonesome West. The Lonesome West deals with the two Connor brothers, locked in an endlessly juvenile fight about everything. Wasting their days away drinking poteen (moonshine) and squabbling over such petty things as a bag of Taytos (a brand of Irish potato chips), as revelations begin to emerge, it is evident the two are seemingly without conscience. Looking to the external to help find that conscience, McDonagh uses the local parish priest. But the priest has his own demons, and the two siblings are so sociopathically beyond redemption, what becomes a game of apologising only stokes the fire more. 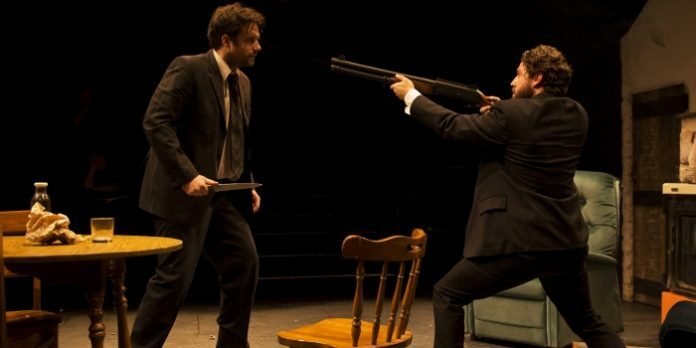 Act one of McDonagh’s play is unyielding in its absurdity as the two brothers go at each other. Directed with a blistering pace by Evan Frayne, it may have many laugh-out-loud moments, but it does little to prepare us for the opening of act two. 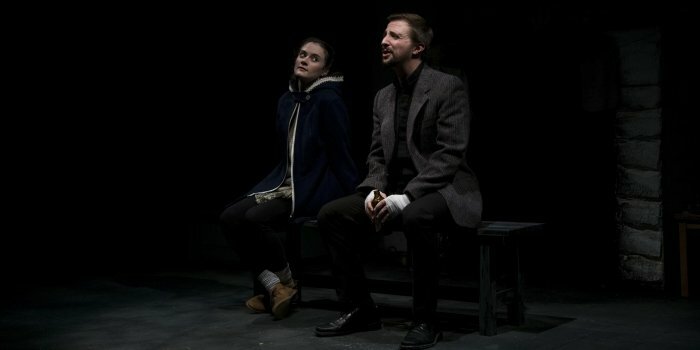 In the second act, McDonagh’s shift in tone is somewhat jarring, especially in the revelations that come from both Girleen, the lone female character in his story, and Father Welsh. There are flashes of redemptive humanity from both of these characters, but it is fleeting, and it is not long before we are back to the two man-boys quarrelling over the insignificant. Not that it is a bad thing, as there is just as much free-wheeling black comedy in the second half to continue this wildly enjoyable ride. Paige Louter and Sebastien Archibald as Girleen and Father Welsh. Photo by Matt Reznek. As Valene and Coleman, John Voth and Kenton Klassen are absolutely terrific. Matching each other note-for-note, there is a naturalness to their delivery leaving little doubt the two come from the same blood. One can’t help but wonder if the two actors, who are roommates, are giving some life to their characters from experience in the real-world. As Father Welsh, Sebastien Archibald is not your stereotypical older, wiser priest, making his fate that much more devastating. Solid in the first act, Archibald absolutely shines in act two. His reading of the letter he has penned to the feuding brothers is riveting. Paige Louter gives a nice intensity to Girleen, with small glimpses of vulnerability. As she confesses her taboo love, we feel her pain. Set designer Sandy Margaret does a decent job of approximating the inside of the Connor country home. And while it is probably a matter of a small budget, the oven which becomes a focal point on a number of occasions, is definitely not fueled by gas. Margaret does manage to pull-off a couple of nice effects with it though. Fight director Josh Reynolds pushes the brother’s fight scenes into cartoon territory, which feels at odds with director Evan Frayne’s more natural approach to the craziness happening elsewhere. The Lonesome West is a grand start for Cave Canem Productions, one of Vancouver’s newest independent theatre companies. For the more established Pacific Theatre to take a chance on presenting their first venture was a risk, one which there is little doubt will pay-off. This trip to Leenane is worth it. You should take your brother. The Lonesome West by Martin McDonagh. Directed by Evan Frayne. A Pacific Theatre presentation of a Cave Canem Production. On stage at Pacific Theatre (1440 West 12th Ave, Vancouver) until November 11. Visit http://pacifictheatre.org for tickets and information.